The paid-parking proposal in Flagler Beach, the latest of many, would have generated money but not for the city: it would have paid for a company to run a complicated system. Even though the city commission found a golf management company in default of its lease, the commission offered yet another conditional set of terms to make the nine-hole golf course work. Flagler Beach and Marina owner Howard Sklar return to court in late September as their settlement talks over the Flagler Beach Marina collapsed when Sklar reversed course on a building requirement. The absence of one of the five commissioners led to the delay on the vote on a controversial measure that would ban the operation of medical pot dispensaries anywhere in Flagler Beach. Vassili Mironov had sued the Flagler Beach Police Department for $89,000 after his arrest at Finns for a fight he says he did not start. He got $6,000 in a settlement that revealed how divided city commissioners arrived at their 3-2 vote. Flagler Beach incumbents Marshal Shupe and Kim Carney have drawn Paul Eik as an opponent. In Bunnell, John Sowell, a former pilot for Flagler County Fire Flight, will challenge incumbents Bonita Robinson and John Rogers. County government’s tourism arm, which manages $1.6 million in tax dollars, is diminishing emphasis on community events to push sports and conferences which draw people without necessarily promoting the county. Addressing his five bosses more bluntly than he has at any point in his four years as city manager, Cambpell told them he’s not interested in another contract and that he’s quitting in September. Flagler Beach Doesn’t Have a Parking Problem. It Has a Big Government Problem. 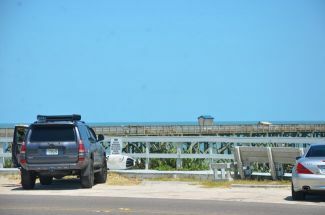 If Flagler Beach adopts paid parking, it’ll invite a problem as onerous as Palm Coast’s red-light cameras, damaging its reputation, needlessly hurting its businesses and alienating its closest and most loyal visitors. Like his predecessor, who was an interim manager of Flagler Beach for five years before he decisively quit, Bruce Campbell is finding it difficult to walk away from the job, and the city commission is not making it easy for him. There were more top state and county officials than Flagler Beach officials at today’s groudbreaking at Gamble Rogers State Park, an echo of the city’s failed attempt to change the name of the recreation area back to Flagler Beach last month. Flagler Beach Mayor Linda Provencher wanted a meeting to further investigate what she considers a dubious $600,000 fire truck buy. Instead, she got a meeting where the commission may finally vote to go ahead with the purchase this evening. Flagler Beach City Manager Bruce Campbell on Friday told his staff he was resigning after three years on the job. He did not give any reasons. In an unprecedented move in the city’s history, Flagler Beach City Commissioner Steve Settled will seek to have Kim Carney removed from the commission chairmanship next week, and replaced with Marshall Shupe. When Commissioner made a motion to pull the $600,000 truck buy proposal out of the budget this year and “think about what we’re doing,” the rest of the commission snubbed her during a contentious, at times anger-tinged meeting. The 65-page petition, published here in full for public examination, has not been authenticated by the city, but would, if verified, pose a serious challenge to a majority of commissioners still intent on buying the fire truck. In two confrontations that upset fellow-commissioners, Flagler Beach City Commissioner Steve Settle questioned resident Rick Belhumeur on what “allowed” him to address issues relating to the city’s fire department and called his public comments “inappropriate” by falsely claiming that Belhumeur was running for office. After the meeting, the two men got in a shouting match. City Commission Chairman Kim Carney has predicted last year that the fire department would soon be asking for a new fire truck, and is raising questions about its proposed financing, including taking more than $300,000 from the city’s infrastructure fund. It is the second successive election cycle in which Flagler Beach commissioners have drawn no opposition. Last year Jane Mealy and Steve Settle were re-elected automatically. Kim Carney and Marshall Shupe were first elected three years ago. When Fuego Del Mar Restaurant owner Nicolas Kimball accused the city of wanting businesses to be successful only up to a point, Flagler Beach Commissioner Joy McGrew shot back, sharply and unapologetically, setting down a marker against repeated accusations of business unfriendliness. Flagler Beach City Commissioner Marshall Shupe questioned fellow-Commissioner Kim Carney’s honesty over talks with county officials on a potential fire department merger after Commissioner Joy McGrew proposed handing the matter to voters next March in a citywide referendum. Flagler Beach Commissioner Kim Carney’s proposal to formally ask the county for information on possible consolidation got no support but was replaced by a watered-down agreement to “ask questions” and have them answered by City Manager Bruce Campbell, through meetings with the county if necessary. Consolidating the Flagler Beach Fire Department with the county’s would save $200,000 and vastly improve fire and rescue services in the city, argues Rick Belhumeur, yet the Flagler Beach City Commission has consistently scuttled debate on the issue while pretending to invite residents to offer cost-saving ideas. Flagler Beach City Commissioner had placed a discussion of consolidating fire departments on the agenda of Thursday’s meeting, only to have City Manager Bruce Campbell pull the item. Carney put the commission on notice that she wasn’t done.